Sometimes truth really is stranger than fiction. The life of Carlos N. Hathcock II reads like the plot summary of a summer block buster movie. Hathcock resurrected the shunned and despised art of sniping and held off an entire company of enemy soldiers for five days with only the assistance of his spotter. He infiltrated deep behind enemy lines to assassinate an enemy commander with a single shot and then escaped undetected and he sacrificed his life and body to save his fellow soldiers. He was feared and respected by his comrades and adversaries alike, he never gave up and fought incredible odds time and again and each time surmounted them. The events are all true, despite the sensational sound of them. 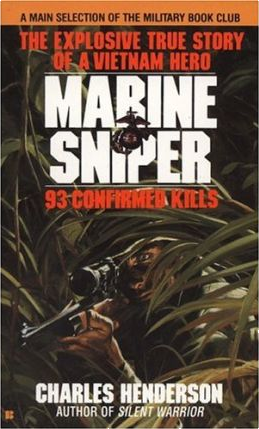 Marine Sniper: 93 Confirmed Kills is a biography of a two times Vietnam War veteran who died a little over twelve years ago. Despite the extraordinary and dangerous path his life took, he didn’t succumb to gun fire, mines, bombs or knives. Frustrated at a body that could no longer do the things he loved to do, confined to wheelchairs and hospital beds, Carlos Hathcock died of multiple sclerosis twenty years after he was unable to serve his country as a Marine any more, and after twenty years of distinguished service. There are on occasion flashbacks which serve to more fully flesh out Hathcock’s personal life and formative years. While these are also interesting, the manner in which they are presented can be somewhat confusing. It is difficult to discern the exact chronology of events and whether they are happening at the current time, narrative wise, or at some point in the past or future. Another irksome point is the infrequent assumptions that all readers will be familiar with military jargon and acronyms. While the occurrences of unexplained acronyms and jargon are not frequent and do not cause the story to lose all meaning, they do serve to break immersion in the tale. Similarly, the author has attempted to remain as authentic to events and facts as possible in the narrative, but the inclusion of long lists of Vietnam- and pre-Vietnam-era weapons, attachments and ammunition will have little meaning to anyone outside of military historians and gun club members. The story of Carlos Hathcock’s life is inspiring and uplifting. Even if one is not the sort to support wars, violence and killing, Carlos’ courage, drive, determination and resolve, not to mention his Herculean strength of will can still provide a template by which to style one’s life. Through many adversities, Hathcock persevered and ultimately triumphed. Ridiculed and harangued for the ideas he sought to introduce to the Marine Corps, Hathcock none the less went out and proved the merits of his ideas and won the hearts and minds of the Marine Corps commanders. Horribly burned while saving his fellow soldiers, he recovered and became a marksmanship instructor, though the pain and scarring in his body were still horrific. Unable to operate a rifle or remain standing on his own for increasingly shorter periods of time, he retired from the marines and became a shark hunter. Carlos N. Hathcock II was a true hero, and Marine Sniper: 93 Confirmed Kills does justice to his tale, and should serve as motivation and succour to anyone suffering trials and doubts their ability to succeed. Read Marine Sniper, be inspired and remember a legend of our generation.